Gen Z Yellow: What’s The Deal? Remember Millennial Pink? That soft blush, rose quartz colour that we knew and loved circa 2017, and was all the rage on Instagram? Everyone looks great in pink. It’s soft, it’s romantic, it’s all-round complimentary on whoever wears it. Well, pink is out baby, and yellow is very much in. What Is Gen Z Yellow? 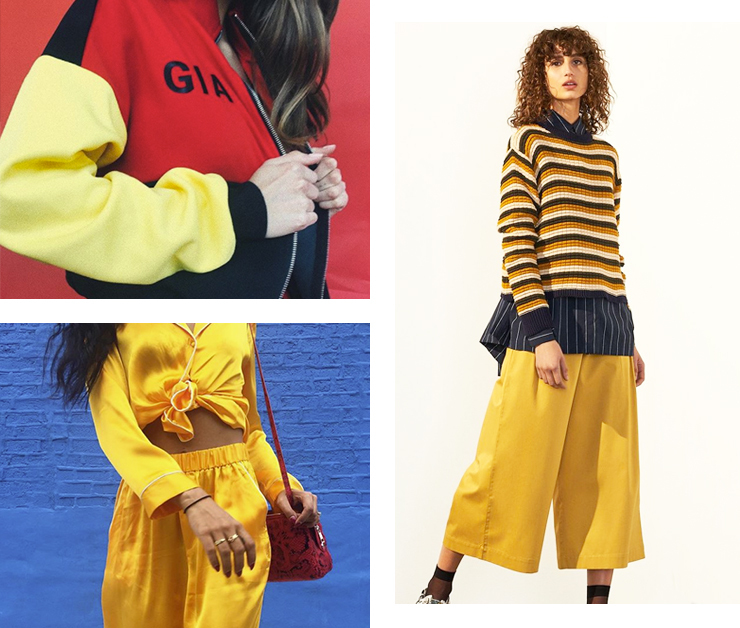 Say hello to Gen Z Yellow, the new, brasher, gives-zero-clucks cousin of Millennial Pink. It’s been described as being on the sunny spectrum “between marigold and custard”, on a scale that’s “lighter than butterscotch, darker than daffodil”, and just simply “bright and canary-coloured”. Whatever the shade, it’s big and bold, notoriously hard to wear, and just as difficult to say. Try as you might, Gen Z Yellow does not roll off the tongue. The internet is divided. Yellow means danger. Yellow means happy. Yellow means your banana is ripe and ready. Yellow is Pikachu, Spongebob Squarepants and Tweety Bird rolled into one. Like a lot of trends, it’s hard to say. The colour was called out by online rag Man Repeller back in August 2017, and then sported via a Kenzo dress by Stranger Things’ Millie Bobby Brown (who also paired it with the season’s other baffling trend, tiny glasses). Her outfit choice earned her the mantle of the “coolest teen at the teen choice awards”. Nekk minit, it’s all over the runway and front rows of the Paris and New York Fashion Weeks. And maybe it was what Cardi B was alluding to in Bodak Yellow. And by the way, she dropped that single a whole two months before Gen Z yellow was coined on the internet. Could it be that Cardi B knew all along that Gen Z yellow would be weaving its way into our still-not-over-millennial-pink hearts? But you can backtrack even further down the yellow brick road of pop culture. There was Emma Stone’s dress in La La Land, Beyoncé’s Robert Cavalli frock in Lemonade (car window smashing and yellow ruffles go hand-in-hand, apparently) and Belle’s ballroom gown in Beauty and the Beast (oh yeah, we went deep). If you’re desperate, you could even look to Kate Hudson’s dress in How To Lose A Guy In Ten Days. First up, you want to avoid looking like you’ve killed a Minion and wore its skin. Yellow is a notoriously difficult colour to pull off. I’ve lost count of the number of times my grandmother has warned, “Asians can’t wear yellow”, but she also told me whistling is bad because it attracts ghosts, soooo...? As with most fashion trends, top-to-toe yellow is a no-no. Start with tasteful splashes of canary via a handbag, a shoe (or two), and jewellery. Next, upgrade to a larger wearable. Stripes, florals and demure plaids do the trick; block-colour mustard skirts and wide-leg pants work best when paired with white tops. Then, when you’ve reached the three-dates benchmark and are ready to Netflix-and-chill with this colour, get bold. Perhaps an oversized faux-fur coat, a long rib-neck dress, or a tailored blazer is your calling, and colour-wise, we reckon the deeper yellow shades like buttercup, egg yolk and marigold will ensure that you wear the new shade with style and taste. Want to find the perfect white tee? Head here.